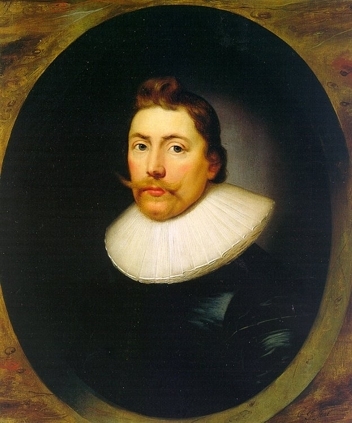 Jan Mathijsen Van CEULEN (1580 – 1639) was Alex’s 11th Grandfather; one of 4,096 in this generation of the Shaw line. Jan Mathijsen van Ceulen was baptised 18 Jun, 1580, St Walburgis Church in Antwerp. His parents were Mathij Wolfaertse Van KEULEN and Mayken MERTENS . He married and Annetje Jansz in Amsterdam in 1600. She took the name Annetje Van Keulen. 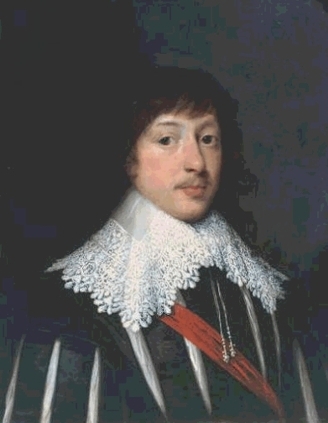 Jan died 30 Sep 1639 – Reusel-de Mierden, Noord-Brabant, Netherlands. Jan’s parents were Mathijs Wolfaertse van Ceulen and Mayken Mertens. Mathijs was b. Antwerp, 1545, and died in Amsterdam, Holland, on April 23, 1619.
i. Hendrick Mathijs Van Keulen was born between 1565 and 1585. He married Barbel Willems Van Deden. ii. Lijsbeth Mathijsz Van Keulen was born in Antwerp about 1570. She married Arent Dicksz on November 29, 1590, in Utrecht, Netherlands. Jan’s grandfather was Wolfaert van Ceulen. Wolfaert probably was the last of this line to have been born in Cologne. Cologne is in Germany today, but it was part of the Spanish Netherlands in the 1500s. The Catholic inquisiton is what forced these Protestants to move north to the safety of the United Netherlands. i. Jacob Wolfaertse Van Keulen was born in Antwerp, Belgium, in 1544. He married first, Selken Jannsens, on 20 Feb 1577/78, in Antwerp. He married second, Tannaken Claudesz Van Bruiyssel, on June 18, 1594, in London, England. Jacob lived in London(Austin Friars Church records) and Mathijs’ parents were probably visting him when Mathijs was born in London. A court of Holland, Amsterdam document, dated 1 July, 1633, gives Jan’s age as 52. It also names the wife (Lyntje Michelse) of his son Cornellis, and gives her age. Only other document found, so far, bearing his name, is the baptismal record of oldest son, Mathij Jansen Van Keulen, 2 Feb, 1601, Austin Friars DRC, London, England. *Baptism date controversy. 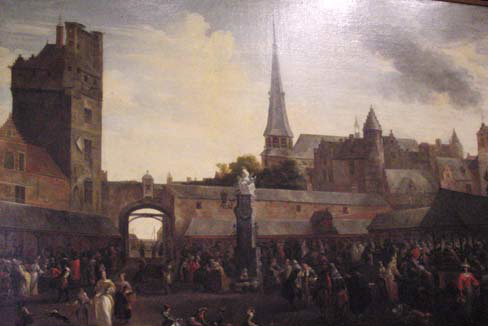 It is known that Jan Mathijs van Ceulen was in London on business 1601/1602. Also known is that Jan Mathijs’ uncle, Jacob Wolfaertse van Ceulen, was married in and probably living in London. The 2 Feb, 1602 Austin Friars baptism of Mathijs was always assumed to be son of Jan Mathijs, because of the fact he was there, plus the fact that there was no baptism of a Mathijs in Holland, specifically Amsterdam. However, examination of the actual handwritten baptismal shows name of the father as Mathijs, instead of Jan Mathijs. Clerical errors were common in church records, so the question becomes…is this Mathijs the son of Jan Mathijs and the church record is in error, or is this another Mathijs van Ceulen? Mother’s name was not included in the record, and sponsor names gave no clues. Until evidence is received to the contrary, the 2 Feb, 1602 date will be used. 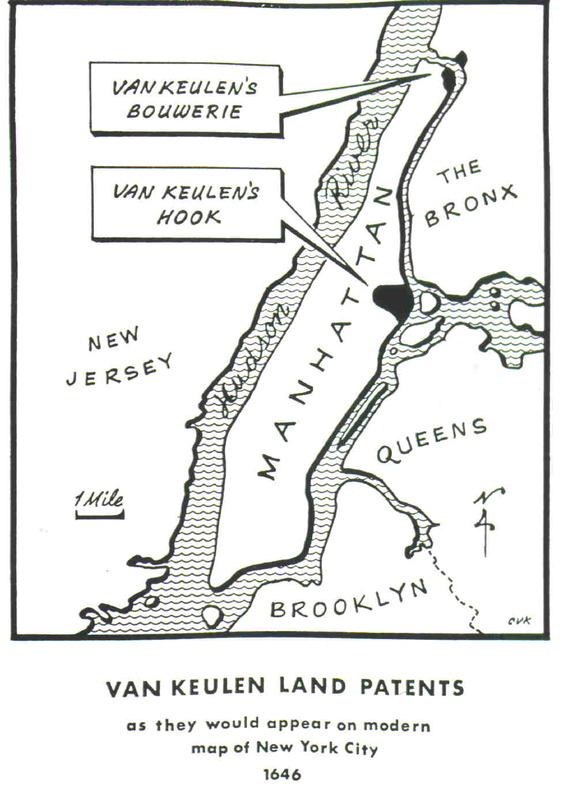 Aug 1639 – Mathijs is recorded on the land of brother, Conraet Jansen van Ceulen (aka van Keulen) in North Harlem…a plot called “Keulens Hook”(History of Harlem). Van Keulen's Hook - In 1639, Conraet van Keulen secured a Patens for 100 Morgens at Otterspoor, renamed Van Keulens Hook. This being located between present day 108th and 125th Streets, along the River, in Harlem. 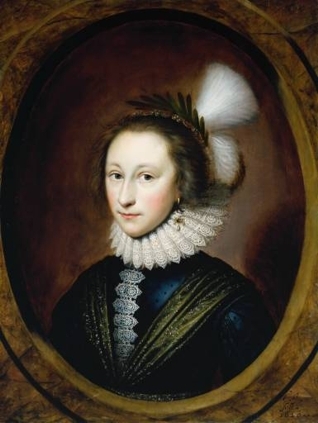 Cornellis’ wife Lyntje Michielse was born about 1607 in Amsterdam. Cornellis narrowly escaped an Indian raid at Achter Col, in which the colonists fled when the Indians set fire to the main house. Matthys’ brother was Cornelis Jansen van Ceulen which is the same name as a famous British portrait painter. However, Cornelis the brother was born in Amsterdam about 1605, and died after 1648 and married Lyntje Michielse. Cornelis the painter was bapt. 14 Oct 1593, London and burried 5 Aug 1661, Utrecht. Our Jansen van Cuelens were establishment, but the painter’s were refugees. He’s not our relative, but I enjoyed looking at his portraits. This entry was posted in 13th Generation, Line - Shaw, Place Names. Bookmark the permalink. Fantastic genealogy blog! We share several ancestors. My question is why you think the London baptism is for Matthys. According to the Van Curen website, the record shows Mathijs for his father which is inconsistent with his patronymic Jansen (suggesting that Mathijs’ father was named Jan).